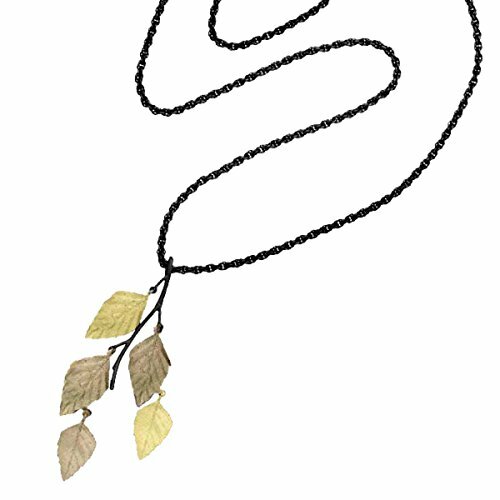 This beautiful necklace by Michael Michaud is cast in Bronze in a mold made directly from real leaves in order to perfectly capture the plant's form and texture. Item is brand new and comes in a lovely gift pouch. The whimsical weeping birch creates a unique landscape all its own. With its bright white bark and long, downward leaves, its beauty has been referenced in literary works throughout centuries. with its vibrant colored leaves in autumn, it's a popular draw during leaf peeping season. Comes in a Gift Pouch! If you have any questions about this product by Michael Michaud, contact us by completing and submitting the form below. If you are looking for a specif part number, please include it with your message. Fronay Co .925 Sterling Silver Designer CZ Marine Links Rhodium Plated Necklace, Length 17"